If not already done, first cook the lentils. In a medium pot, bring 2 cups of water, a pinch of salt and the lentils to a boil. Reduce heat and simmer for 25 minutes. Drain any excess water and set aside. Dry toast the almonds over medium heat for a few minutes until golden. Set aside. For the dressing: In the measuring beaker that came with your hand blender (or in a mason jar), add the strawberries, balsamic vinegar, water, flaxseed oil, basil leaves and a pinch of salt. Process the dressing until nice and smooth. Refrigerate until ready to serve. This can be done a few hours (up to one day) ahead of time. To assemble the salad: Place a large handful of arugula on each plate. Sprinkle ~1/4 cup cooked lentils, a generous pinch of minced garlic scapes and decorate with fresh strawberry pieces. Top with fromage frais if using, and sprinkle the toasted almonds and basil chiffonade over each plate. 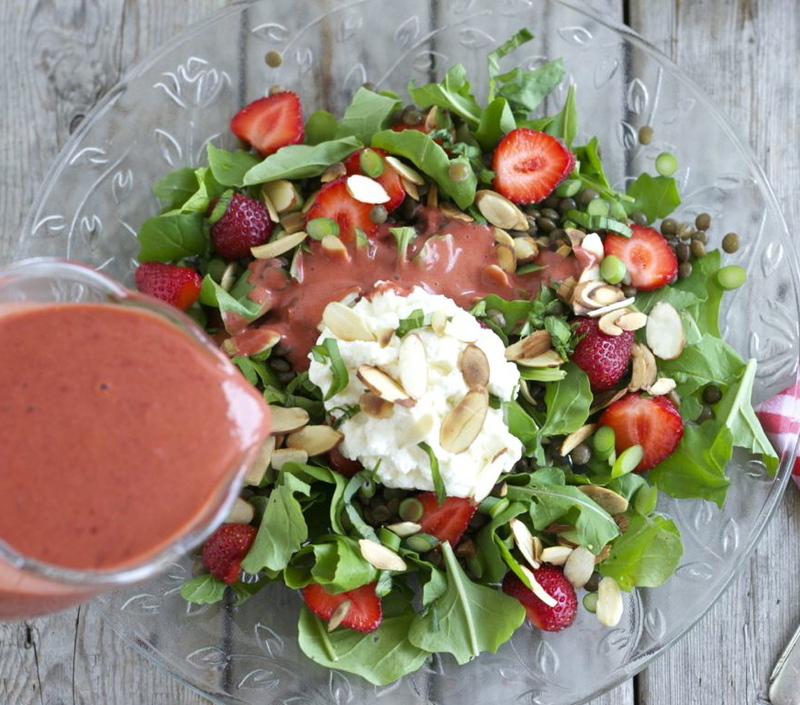 Pour the strawberry-balsamic dressing over the salad and savour at once.